Paint the Town: Informed Design at Long View We went to the opening reception for the "Informed Design" exhibit at Long View Gallery and got exclusive interviews with some of the designers! We went to the opening reception for the “Informed Design” exhibit at Long View Gallery and got exclusive interviews with some of the designers! On a warm summer evening, art and design lovers joined at the Long View Gallery in the historic Shaw District to take a look at the newest exhibit, “Informed Design.” This presentation explored the roll of art objects within the context of interior design and architecture, which included designs from renowned architects Ernesto Santalla and David Jameson, who consider art as a hub of their design processes. The purpose of Informed Design is to demonstrate how artwork can enhance and interact with space; to allow viewers to understand the relationship between art and architecture. 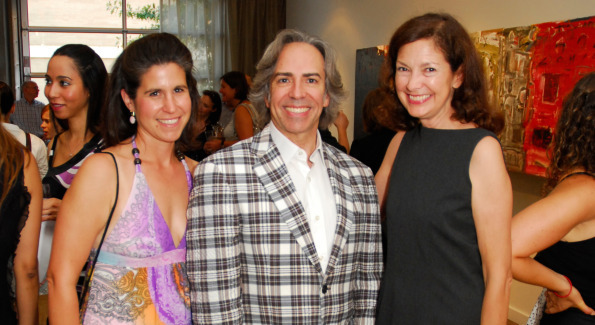 As guests entertained their eyes with unique art and designs, they sipped on summer cocktails, savored hors d’oeuvres, and listened to music by Laissez-Foure. Another installation was designed by architect David Jameson, who was inspired by the gallery’s industrial look of exposed brick and concrete floors. Jameson installed gallery pillars, reflecting the concrete beams of the gallery, to act as walls. He then adorned the structure with artwork from various artists including Steve Cushner, Mary Early, James Huckenphaler, and Jackie Hoysted. “Informed Design” will be showing at Long View Gallery until August 1st, 2010. For More information click here.